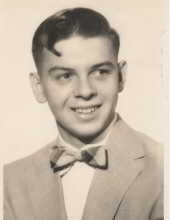 Norman L. Hilleshiem, age 80, passed away peacefully on April 3, 2019 at Schmitt Woodland Hills. He was born on November 4,1938, to Virgil & Bernadine (Peckham) Hilleshiem, at home in Marshall Township, Richland County. Norm’s life revolved around wheels from an early age. If it had wheels, he wanted to ride it, paint it, fix it, or sell it--from soapbox derby cars to bicycles to Cushman scooters, then go-carts, cars, snowmobiles, and Mopeds. After graduating from Richland Center High School in 1956, he worked in Wisconsin auto plants, then as an automobile mechanic, eventually starting his own repair business. He was owner and operator of Norm’s Auto Sales on Highway 14 east of Richland Center since 1966. He sold and serviced Polaris snowmobiles from the late sixties to late eighties. Norm was a dedicated leader in the Richland County Snowmobile Alliance, working to build and maintain trails for almost 50 years from 1968 on. During the winter months, he enjoyed snowmobiling with his family. During the warmer months, he traveled and went camping with family and friends. In 1997, Norm was a founding member of the Backroad Express Riders. He was a member of the Lions Club, Richland Area Senior Citizens, and the Parkinson’s Support Group. Volunteering for blood drives and other community efforts was important to him. He is survived by two daughters, Colleen Manning (Ron) of Sextonville, WI, Julie Hilleshiem (Mike Feldt) of Oak Creek, WI; seven grandchildren, Anna Manning (Mark Matthys) of Sun Prairie, WI, Beth Magstadt (Adam) of Cedar Rapids, IA, Cara Manning of Dubuque, IA, Dawn Manning of Washington, D.C., Evan Manning of Estes Park, CO, Elizabeth Hilleshiem of Oak Creek, WI, Faith Manning of Sextonville, WI; five great-grandchildren; one sister, Evva Lou (Bill) Dawdy of Des Moines, IA; two nephews, Kirk and Craig Kintz of Des Moines, IA, and many other dear relatives and friends. Along with his parents, he was preceded in death by his son, Gary L. Hilleshiem, and nephew, John Todd Kintz. Funeral services will be held at 11:00 AM on Tuesday, April 9, 2019 at the Pratt Memorial Chapel. Visitation will be held at the Pratt Memorial Chapel on Monday, April 8, 2019 from 5:00 PM until 7:00 PM and again at the Pratt Memorial Chapel on Tuesday, April 9, 2019 from 10:00 AM until the time of service at 11:00 AM. A private burial will be held at a later date in the Richland Center Cemetery. The Pratt Funeral and Cremation Service is assisting the family with their arrangements. Online condolences may be made at prattfuneralservice.com. To send flowers or a remembrance gift to the family of Norman Lee 'Norm' Hilleshiem, please visit our Tribute Store. "Email Address" would like to share the life celebration of Norman Lee 'Norm' Hilleshiem. Click on the "link" to go to share a favorite memory or leave a condolence message for the family.